I will step out of my mission to watch the top 250 films of IMDB to review Tangled, a Disney Animation Studios movie released last year to critical and commercial success. Tangled surprised me. It was irreverent, witty, beautifully rendered and cleverly scripted. It comes as no surprise, however, that the mastermind behind the revamping of an old princess tale is no other that the founder of Pixar, perhaps the most innovative studio in Hollywood. In the deal that brought Pixar under the umbrella of Disney, both studios compromised to work together to give the legendary Disney Animation wing a breath of new life. Tangled is an interesting fusion of the styles that have defined Pixar within the traditional and romantic storytelling of Disney. It is in the partnership of both that the movie blends an otherwise typical princess story into a modern animated film that is set to entertain people of all ages. It has the charm and the scale of old Disney but with the edginess and vibrancy of a Pixar production. The movie follows Rapunzel (voiced by Mandy Moore), a princess stuck in a castle due to a very deceiving witch (Donna Murphy) who kidnaps her as a baby from the king and queen of this picturesque world while pretending to be her mom. The witch manipulates the princess by painting a world full of deceit, selfishness and horrible creatures that want to cut her magic hair. Now, given the formulaic set-up of Tangled, the narrative does wonders to use humor and sarcasm to start defining the unique relationship Rapunzel and “mother” have. As it is accustomed in animated movies, the secondary characters are animals with human-like personalities that are as interesting (if not more) than those of the main characters. In Tangled we find a cute little chameleon that acts as Rapunzel’s sidekick and later an incredibly persistent horse that chases after Rapunzel’s love interest, the modern prince turned thief, Flynn Rider (voiced by Zachary Levy). Both main characters have an authenticity to them that is sometimes at odds with the overly beautiful and unreal scenery that they share. 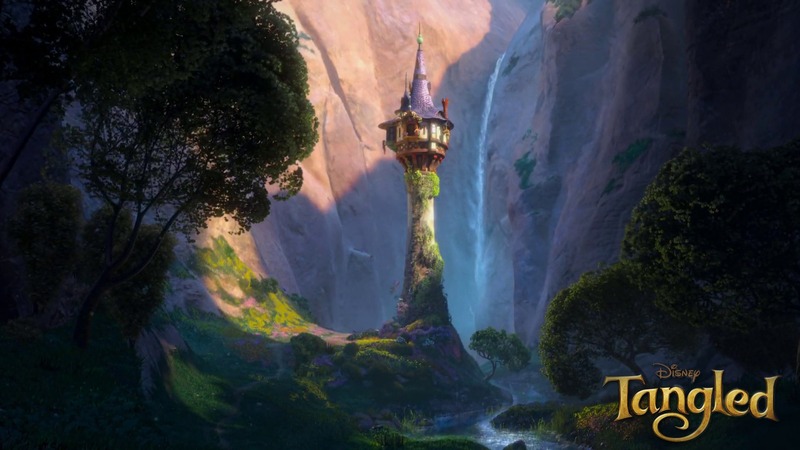 The wittiness of Flynn blends nicely with the innocence of Rapunzel. The adventure they embark on is one of self-discovery, for Flynn it turns into a life-changing expedition that allows him to rethink his priorities and, for Rapunzel, the first and best day of the rest of her life. For its charm, beautifully-rendered animation, wittiness and modern take on an old child’s tale, Tangled gives Disney Animation a brand new hit for a new generation of moviegoers.